Entrepreneurs and small-business owners often think that incorporating video into their marketing or communication plan -- let alone configuring a website for video -- is costly, complicated and beyond reach. With the launch this week of Vimeo PRO from Vimeo, nothing could be further from the truth. Online video is expected to account for half of all consumer Internet traffic by the end of next year, according to a recent Cisco report. Further, a Forbes Insights survey from last December showed that nearly 60 percent of those online will watch a video before reading the text on any given webpage -- and they’re more likely to make a purchase. These findings should prompt businesses of all sizes to see the urgency of matching the growing demand for video-related content with videos of their own. Enter, Vimeo. The second most popular online video portal behind YouTube, is finally giving small businesses and commercial enterprises overall their chance to get in on the video action. With Vimeo PRO, $199 a year gives businesses a simple and affordable professional video-hosting solution, complete with analytics for gauging return on investment. Each year, users receive 50 gigabytes of storage and 250,000 plays for video embedded on your own website in a player branded with your company’s logo. That’s enough to upload between 700 and 2,000 five-minute videos, depending on the video format you use. Think you'll need more? It’s $199 for each 50GB increment. You can also buy additional plays in increments of 100,000 for $199. And unlike Vimeo.com, which doesn’t permit commercial content, Vimeo PRO is tailor-made for businesses -- offering a platform built from the ground up to promote or sell a product or service. With Vimeo PRO, your business’ video content can be integrated into your website in an environment that enables you to add your logo to the video player itself. And, unlike YouTube and "regular" Vimeo, nobody else’s advertising appears on top of your videos, and you have access to an advanced dashboard featuring key performance indicators such as the number of times your videos have been loaded, played and finished, just to name a few. Putting small businesses on an equal footing with the big boys, Vimeo PRO offers exceptional video quality -- including features like high definition and HTML5 video. It also provides portfolio websites that you can customize, video review pages and integration with leading social-media utilities and platforms. And if video isn’t your strong suit, PRO account holders can access Vimeo's online education portal, Vimeo Video School. Vimeo PRO is a worthy choice for entrepreneurs and small-business owners looking to host video on their own sites in a branded environment devoid of the types of ads that get embedded into videos from YouTube. Corrections & Amplifications: An earlier version of this post misstated Vimeo PRO's search engine optimization capabilities. 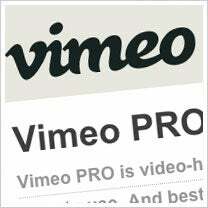 Vimeo PRO includes SEO features. Will Vimeo PRO help you take the leap into hosting your own videos? Leave a comment and let us know.